[SINGAPORE] Barclays investment bankers in Singapore are among those who will lose their jobs as the group axes about 30 per cent of staff at its investment bank division in a retreat to focus on primary markets in the UK and US. CEO Antony Jenkins told BT last night that while there will be some job cuts here, Singapore remains significant for Barclays. He said that the 7,000 job cuts - or almost one in three - will be "spread around the world". Calling the investment bank an "unacceptable drag on group returns", Mr Jenkins told analysts in London earlier in the day that he was determined to cut it down to size. Early this week, the investment bank posted a 49 per cent slide in Q1 profit, hit by volatility in debt, currencies and commodities. 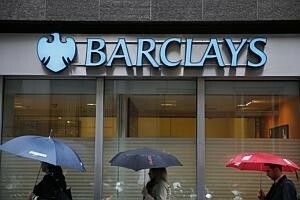 Barclays will reduce the capital deployed in investment banking to 30 per cent from 50 per cent now. "We aim to be a globally relevant investment bank, benefiting from a top-tier home market franchise in both the UK and the US," Mr Jenkins told analysts. The US and UK account for 60 per cent of the investment bank market globally, he said. Barclays will cut back in Asia, and focus on US, UK and key global clients who do business in Asia, Mr Jenkins added. The British bank will cut 7,000 jobs from the investment bank, which is 24,000-strong. Group- wise, it plans to slash 19,000 jobs - more than half in the UK - which will take headcount down to 120,000 by 2016. Sources told BT that there had been two rounds of layoffs in Asia earlier. "Over the past 18 months, there's been a couple of rounds of job losses in Asia . . . we're already very lean," the sources said. In January last year, it was reported that Barclays had laid off 70 bankers here and across Asia. Barclays Singapore, which employs 3,000 people, is the group's biggest centre in Asia. "Barclays is absolutely committed to Singapore," said Barclays Singapore spokesman John McGuinness. "It's a key location for us." Barclays Singapore has three main businesses: investment bank, corporate bank, and private bank. Singapore will remain a key hub for the group's fixed-income and macro business, which is foreign exchange and interest rates. The group's global procurement functions, back-office IT and operations teams are here too. Barclays' private bank business in Asia, which employs about 380 staff in Singapore, is thriving. The Asia private bank has a total of 650 people. The private banking business will not be touched, another source said. Assets under management (AUM) in Asia grew 27 per cent to over US$35 billion in Q1 2014. Asian Private Banker noted that the bank was one of the biggest gainers in Asian AUM. Barclays Singapore went on an expansion drive 10 years ago when Mr Jenkins' predecessor, Bob Diamond, decided to make investment banking a global business. In 2004, Barclays employed about 500 people here, with 150 in investment banking. Mr Diamond, whose forte was investment banking, was unceremoniously kicked out of the bank in 2012, taking the rap for interest rate rigging.